The Division of Plant Pathology is more than 100 years old. 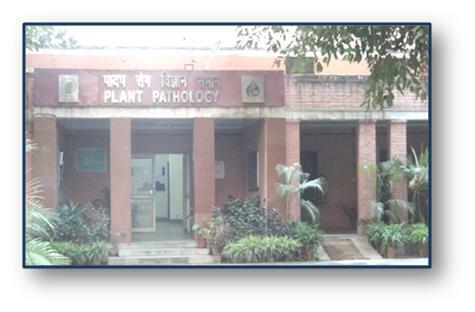 It was originally established in 1905 as Mycology section of Imperial Agricultural Research Institute (IARI) at Pusa, Bihar to initiate mycological and plant pathological research in India. The sectional status was raised to the status of Division of Mycology in 1943-44 after the Institute was shifted to New Delhi. Subsequently, it was named as Division of Mycology and Plant Pathology in 1947-48 and later it was designated as Division of Plant Pathology. Two Regional Stations, one at Pune (Maharashtra) and other at Kalimpong (West Bengal) were established in 1939 and 1956for the research on plant viruses. Disease diagnosis, detection of pathogens and management of disease risks have been the main fabric of Divisional research. The Division has evolved over the years with four major sections, i.e., Mycology, Fungal Pathology, Bacteriology and Virology. Herbarium CryptogamaeIndiaeOrientalis (HCIO) and Indian Type Culture Collection (ITCC), Center for Advanced Faculty Trainng (CAFT) in Plant Pathology and Referral Center for virus indexing of tissue culture raised plants are the "Life Lines". The Division has highly trained scientific, technical and field staff. It has well equipped laboratories to work on diagnosis and characterization of plant pathogens, electron microscopy, cloning of genomes, electrophoresis, sequencing, use of PCR in disease diagnosis, tissue culture, plant transformation etc.